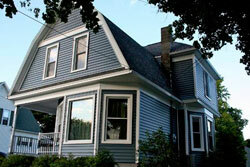 Saving energy in a beautiful home is a goal for many residents in Willoughby, Ohio. Exterior remodeling products from UWD hits the mark on quality, affordability, and value. Those who are looking for replacement windows, vinyl siding, entry doors, and roofing will find a vast selection of styles and aesthetic upgrades from UWD. These are the ideal products to lower utility bills and dramatically transform curb appeal. Seasonal fluctuations and dramatic temperature changes are no match for UniShield® replacement windows. Even in a variable climate such as Willoughby, homeowners will experience the true power of energy savings through these window products. UWD engineers these windows using advanced technology. Four tier levels of glass packages use these solutions for maximum comfort levels. Dual and triple pane glass create a barrier to block energy from escaping, while energy efficient gases increase thermal efficiency. One-to-two coats of low-e application helps to reduce UV rays from fading furniture in the home. It also helps keeps home warmer in the winter and cooler in the summer by reflecting sunlight. New windows can also make your home more attractive. 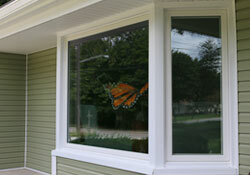 UniShield® is a vinyl replacement window with durable and low-maintenance frames. These frames are available in colors that coordinate and contrast with any curb appeal, with colors ranging from red to green and beige. UWD is the best window company to find all types of window styles. The double hung window is a popular choice since it blends easily with any architecture and features a tilt-in option for easy cleaning. Bay and bow windows are good choices to create a grand appearance with new windows, while picture windows and slider window maximize natural light. Enjoy professional window installation with Universal Windows Direct. Our installers keep the windows performing at top condition 365 days per year. For guaranteed performance, UniShield® is protected under our True Lifetime warranty, which covers pieces, parts, installation, and more. Get your free estimate for affordable and high-performing replacement windows now. A beautiful roof without a system is like a Ferrari without an engine. A roofing system is comprised of many components that drives energy savings and keeps homes dry. UWD offers incredible roofing systems with our partner Owens Corning, one of the most well-respected roofing manufacturers in the country. The system begins with asphalt shingles that add depth, dimension, and protection to the roof. These help block rainfall from reaching the roof deck, which can result in costly water damage. The shingles are designed for performance as well as aesthetics, and Willoughby homeowners are pleased with the selection of various hues inspired by nature. Owens Corning shingles are the definition of durability. They are adhered to the roof using SureNail technology. This keeps the shingles in place in winds of up to 130 MPH. The shingles are also heavier and more durable than comparable products in similar price ranges. Below the shingles lies WeatherLock G—a self-sealing ice and water barrier that is incredibly efficient at blocking out moisture. This additional layer of protection reduces the risk of moisture damage while improving roofing performance. This roof system also includes intake vents to maximize ventilation. Moisture in the home from showering, washing dishes, and other tasks will eventually make its way to the attic space. If this moisture becomes trapped, condensation can occur which results in water damage. A superior ventilation system is efficient at allowing the attic to properly breathe. Owens Corning roofing includes a 10-year craftsmanship warranty, Additional protection is available through UWD’s TruPROtection warranty. 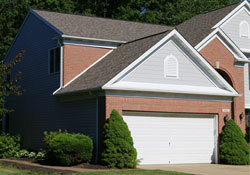 Homeowners can also enjoy professional roofing installation when choosing Owens Corning roof products. Choose a quality roof that lasts for decades. Contact us for an estimate. Fiberglass entry doors are the ideal alternative option against traditional wood doors. A wood entry door is susceptible to chipping, warping, or even rotting. Entry doors from UWD do not require treatment against moisture, and they require very little maintenance after installation. Enjoy a variety of colors for our steel and fiberglass entry doors, including traditional wood stains and modern paint colors. Homeowners can also order a new door primed and apply your favorite paint or stain color. Various hardware finishes and lock combinations are also available to enhance security and peace of mind. Entry door installation is available through UWD. The installation combined with durable weatherstripping and a polyurethane foam core keeps homes at an ideal temperature. Enjoy a performance guarantee with a new door through our True Lifetime protection warranty. For questions about performance, aesthetics, or to schedule a free estimate, contact us now. Engineered with heavy gauge plastic, homeowners can’t go wrong with UniShield® siding. This vinyl siding is exceptionally effective at improving curb appeal while providing a layer of insulation. Insulated panels help maintain indoor temperature, and the panel thickness is available of up to .46”. Professional siding installation from UWD ensures performance through every season. Every panel is precisely engineered for performance and beauty. The panels include lifelike wood grain patterns in a variety of modern colors. Extra aesthetic upgrades are available, including vinyl scallops to highlight window gables, vinyl cedar shakes for a rustic appearance, and soffit to conceal unsightly rafter beams. UniShield® vinyl siding includes a 20-year color guarantee protection in addition to the True Lifetime warranty. For siding that protects and beautifies the home, consider UniShield® exterior from UWD.